Some Vehicles I’ve driven over the years. 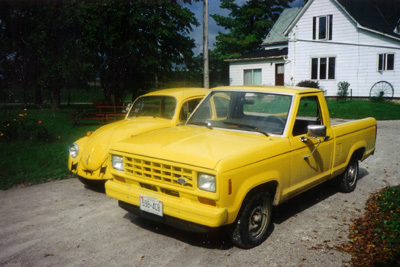 1970 Volkswagen Beetle (first car I owned), and 1985 Ford Ranger (first truck I partially owned). Both painted Corvette Yellow. I sold the Beetle and drove the hell out of the Ranger. It was a one of a kind. The yellow paint job was about the coolest thing going. The best there is, the best there was, the best there ever will be. The 1991 Mazda B2200. 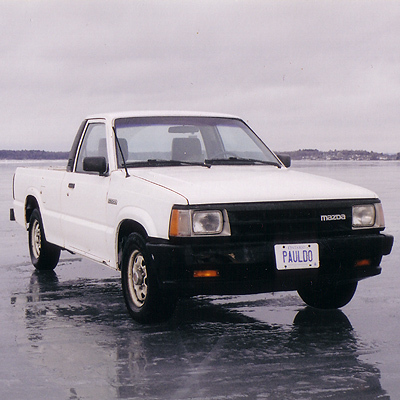 This photo was taken January, 2004 on a frozen Callander Bay, south of North Bay. I love this photo and I will hang it above her casket when the day comes. For now, 531,600 km and counting..